The rulers of all the major capitalist states have no solution to a world economic crisis which in various forms has now dragged on for decades. In the last few years chronic insoluble conomic crisis has increasingly translated into political crisis. This has produced not just changes in government but questions about the institutions of these supposedly democratic regimes. From the election of a US President who spends a great deal of his time attacking other branches of the state, to the disillusionment with Europe seen from UK’s Brexit to the reactionary nationalism of Poland, Hungary and Austria to political instability elsewhere in Europe. It took the German ruling class months of horsetrading to establish the fact that the government would not change and the old Social Democrat and Conservative coalition would continue in opposition to the reactionary right of the AfD. In Italy an unlikely coalition of nationalists and populists who have no real overall majority has squeezed into office whilst in Spain a political adventurer has managed to achieve power via a procedural motion to oust the Popular Party’s grip on government. Despite only having about 80 seats in the Cortès the Socialist Party under Sánchez have been installed as a minority government. The following short article, translated from the Spanish blog Nuevo Curso, explains the consequence for the working class.. 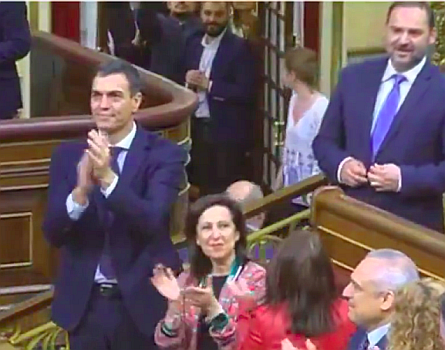 Finally, Pedro Sánchez got the lucky break he was counting on and, on the First of June, the parliamentary motion of no confidence gave him power. This is not how the bourgeoisie were looking to renew its political apparatus. What do we make of all this? Sanchez came to power in an unlikely way, with the votes of the Catalan separatists, Bildu and the Basque nationalists PNV being decisive. This shows that the bourgeoisie were right to try to reform their political apparatus and electoral rules in order to avoid governments, without an absolute majority, which are chronicly dependence on regional petty bourgeois parties whose demands are increasingly difficult to satisfy. Rajoy and the Popular Party [PP] were so stunned, that neither he nor they appeared in Parliament after learning how the Basque Nationalist Party intended to vote. Until the very last moment Rajoy dithered about trying to avoid the vote (of no confidence in the Government – CWO) by resigning in order to put a spoke in Sanchez’ wheel. The PP, surprised by Sanchez’ success, felt betrayed by the Spanish bourgeoisie and went off in a huff, weakening the political apparatus of the entire state, bleating that all parties are as corrupt as they are and accusing Sanchez of "dark pacts" with the independence movement. Sanchez, who is aware of the difficulty of the balancing act he is undertaking, made soothing noises, insinuating that he will support the continuity of the PP as a great party on the right and allying with the PP and Podemos in their attacks on the centre right Ciudadanos party. This party, has been the white knight leading the reform of the Spanish political apparatus. Now, it is on its own, caught in an unexpected crossfire and crossing its fingers before the next elections. The only way for Sanchez to consolidate a government in the wake of his surprise victory, is to steer the Catalan question towards an agreed resolution, which will have to be in line with what the industrial sectors of the Catalan bourgeoisie have been looking for: a special Catalan regime with almost no economic contribution to state coffers and with a legal framework that allows the Catalan petty bourgeoisie a free hand and a media veil that covers over its obsession with the cultural oppression of the mostly Spanish speaking working class. This has been the only clear message that could have been interpreted from his speeches of 31 May and 1 June. To continue playing this game, Sanchez needs to keep upping the ante. He must stick to Rajoy’s recently approved budget, which will bring increased investment to the Basque country, but he will also, hand in hand with Podemos, have to present a socially caring face if they want to be able to sell Sanchez as having a minimal illusion of social sensitivity about him. Sánchez and Iglesias will introduce low cost social policies  as the last flag of their supposed progressivism. The arrival of Sanchez to power means a change of game in the reform of the Spanish bourgeoisie’s political apparatus. The triumph that has emerged as the result of an adventurer’s manoeuvrings, is not going to be easy to maintain. In fact, it will lead to a new legislature focused on constitutional reform - whether or not it affects the Constitution of 1978 - changing the law around elections and the Senate, and exchanging, in the end, long-term parliamentary "governance" for financial independence, the tools of international representation  and an open way for the construction of a national identity for the small Basque and Catalan bourgeoisies. What will follow has the look of exacerbating the fragility and weaknesses of the Spanish bourgeoisie with all its contradictory features, from the idea of supremacy of the regions to the will to survive of the old apparatus. The resistance of central fractions of the Spanish bourgeoisie, and its expression in the media against the inconvenience of the new surprise element, Sanchez's personal ambition, is practically guaranteed. But even if he managed, by some miracle, to generate a new consensus among the Spanish bourgeoisie, Sanchez would only be opening up a new path just to reach the same place: the frontal attack by the Spanish bourgeoisie on workers’ working conditions and pensions, and this before the crisis is reinforced by a new trade war that threatens to put Spain back into the red. Which will probably have greater political than economic impact. For example: there may be some extra money to deal with gender violence. None of it will go to real needs like new kindergardens or schools, hospitals or to end low cost sacking of workers. Regions in Spain already have tools for international representation, offices abroad, etc. The new thing is that they will probably take part with the government in the EU meetings and negotiations related with them, as happens in Belgium.